This jetty bar is packed with blooming plants and flowers, string lights popping with primary colours and an unpretentious gay-friendly crowd. 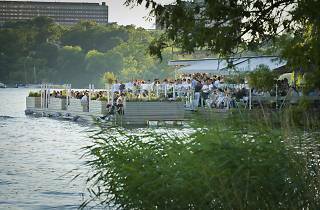 Floating on the water next to one of the city’s most stunning tree-lined footpaths, Norr Mälarstrand, Mälarpaviljongen also boasts incredible views towards Södermalm island (ook out for the iconic red-brick former brewery, Munchenbryggeriet). 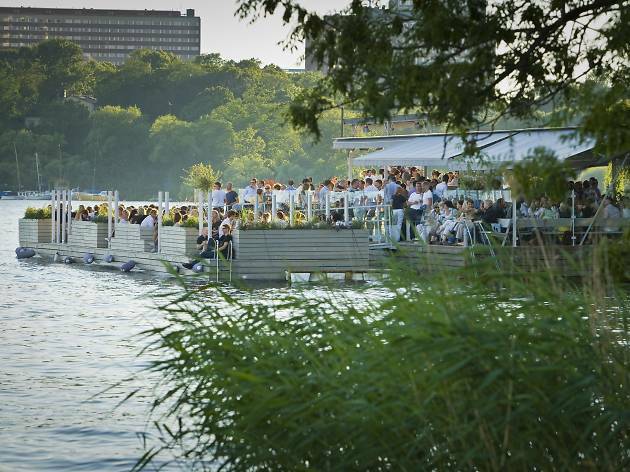 Sipping a glass of champagne or a rosé on the wooden sun deck at Mälarpaviljongen during a hot day is about as good as it gets during Stockholm’s blink-and-you’ll-miss-it summertime. On cooler days, look out for the soft grey woolen rugs dotted around the venue and wrap up with a coffee and a slice of cake from the cafe area closest to the walkway. Note that Mälarpaviljongen is typically closed between October and April. Time Out tip: The beautifully presented snacks lined up along the bar (think luxury nuts in hinged jam jars and strawberries stacked in giant wine glasses) look tempting, but they are well overpriced even by Stockholm standards.